It has been a hot and dry summer here in northwest Oregon. The term 'crispy' is now commonly heard when referring to the state of vegetation here in the Portland metro area. Our summer has been one the hottest and with the Portland city limits seeing nearly no rain all season. No lush green gardens this year, but some plants are thriving and appreciate the warmth. This summer has been just the reminder I needed to keep moving forward with my plan to create a colorful, but low-water requirement, summer garden. 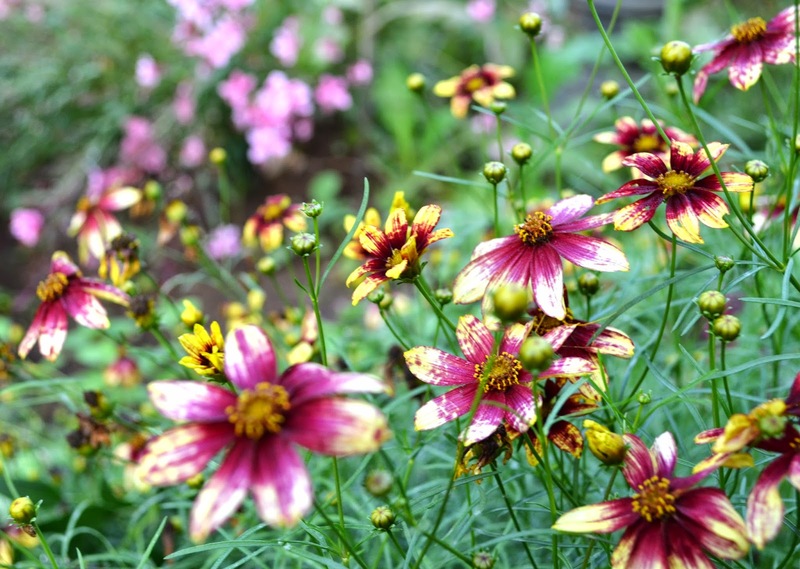 Good ol' Coreopsis can be counted on for thriving in harsh conditions. This plant is full and continues to bloom at the front border of my garden. Why don't I have like..10 of these? I have 4 varieties of Phygelius around my gardens and I love them all. Funfare wine has a deep, rich, gemstone color hue. Phygelius are on my love list because they keep on blooming all summer despite heat and lack of moisture. I love their tall branches that gracefully arch and blend in with surrounding plants. 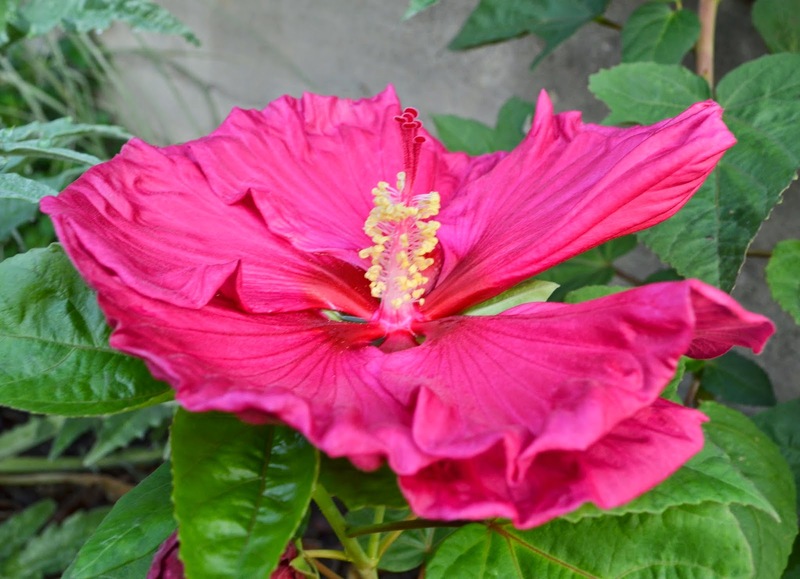 Hardy hibiscus are also on my late summer plant lust list. Big blooms and magnificent color. On a recent drive, I passed a home that had a similar hibiscus in their front garden. The plant was clearly mature and it was huge! I had no idea they could get so big. I may be moving mine to a better spot this fall, so that it has the room to expand. 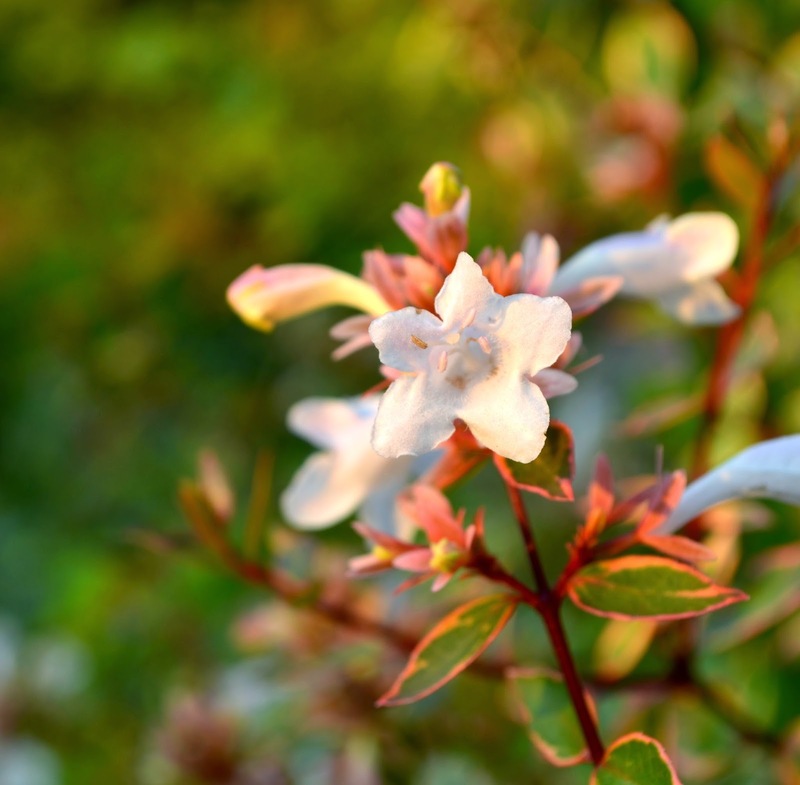 I've had my Abelia in my front yard gardens for the past 2 years and it's been a top performer. Great foliage color. 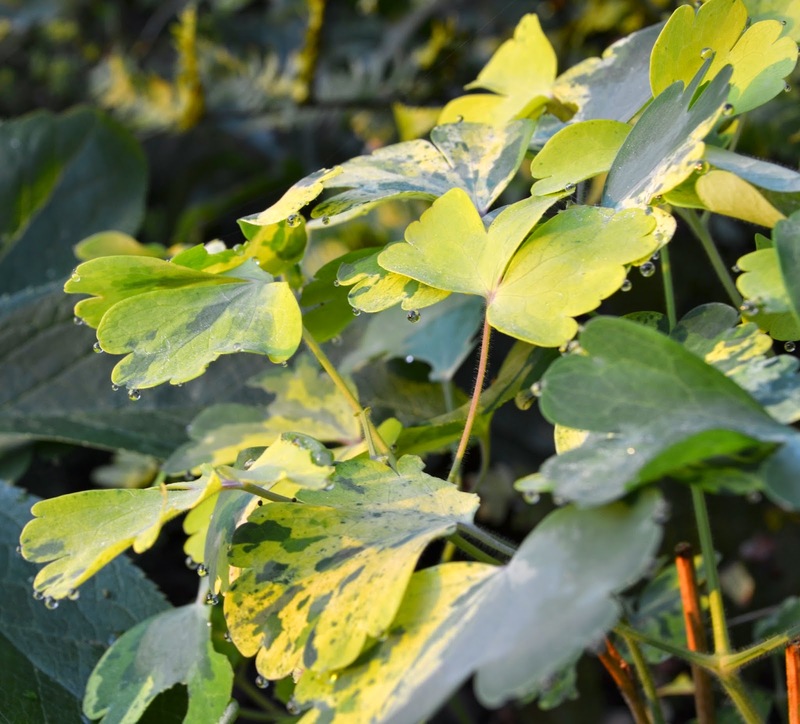 New growth emerges with pink tinged on variegated leaves with arching branches, forming a neat mound that has been relatively easy to keep tidy. The petite flowers with a soft, pleasant scent are a nice bonus. My favorite foliage are my Autumn Ferns. 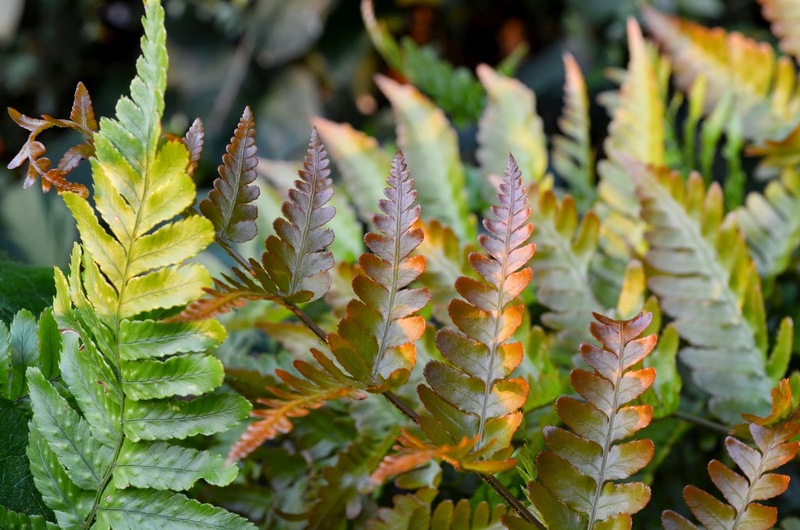 I have new fronds emerging and the color is this fantastic blend of russet - copper. As the plants mature, they continue to expand and grow larger fronds. Oh, I just love them! They provide such a warm glow in the spring and fall gardens. And finally, the foliage of Aquilegia 'Leprachaun Gold' is really fantastic. Bright, chartreuse green, dappled with dark green. I love the fan shaped leaves. This foliage is wonderful in the late summer light. My plant has pumped out some new leaves and creates a 'pop' of color in the shade garden. Despite the heat of late summer, some plants are really putting on a show in my gardens. The nights are getting cooler, despite our hot days and so, there is hope...my favorite season of the year is marching in. Fall truly is around the corner! All wonderfully beautiful! I need to plant some Phygelius. They have been so fool proof, regardless of the summer weather conditions and the hummingbirds love them! Gorgeous pics, your garden looks splendid. Yes, I loves me some good ol' coreopsis, that stuff can keep going and going...your autumn fern looks great, too! Our summers always seem to be flip flopped! I have never seen an Aquilegia with such a beautiful foliage and your Phygelius 'Funfare Wine' is a beauty too. 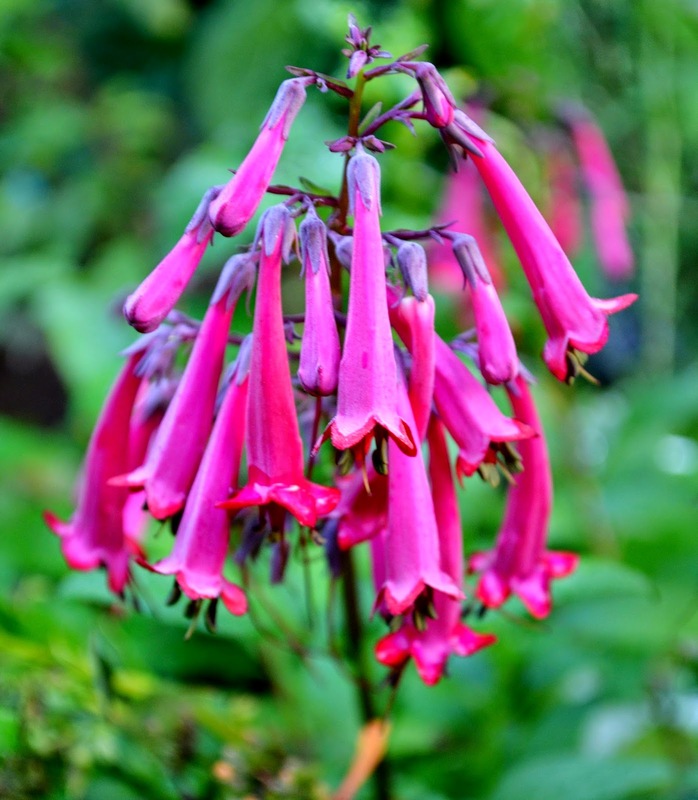 I have some different Phygelius in my garden but this one I put on my wishlist, if it is for sale in our country. The color of funfare wine makes it a real standout, I hope you can find one! Hi, Jenni! Beautiful photos, all. I'm ready for fall and praying for rain_ cannot believe another surge into the 90's again. BTW, still love my earrings you made!!! Hope all is well. Beautiful, beautiful photos, Jennifer. Lovely colour for this time of year. I am finding that the cooler nights are keeping things going nicely here as well. I've never seen that colour of coreopsis before. It's great! Cheers. I'm really loving the late summer colour this year. We're having an Indian summer in Northern Ireland and its been really lovely. Your photography is so wonderful and I love all your blooms. Nothing crispy that I can see! Lovely late summer flowers. I love Coreopsis and Phygelius too. Great post.